I saw this news blurb on Slashdot (you know, the Geek Newsplace) indicating that Wizards of the Coast will not be renewing the Paizo Publishing license to publish both Dragon and Dungeon magazines. That’s it, the paper copy will stop. There’s some mention of providing similar content through some sort of online offering (I’m guessing in a Pyramidesque sort of fashion….you know Pyramid….here’s the wikipedia link). 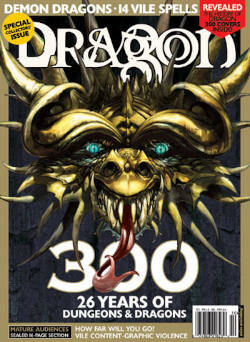 Back when I was but a lad, Dragon Magazine and its sister (brother? Evil, Hellspawn?, anyone, anyone, Pazzazzu?) 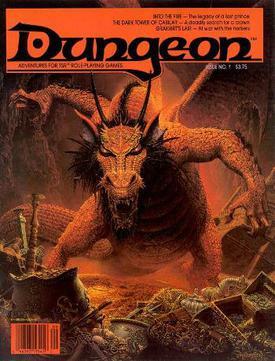 Dungeon Magazine were sources of new gaming information that were intriguing, engaging, a treasure trove to our gaming, and all that adjectivist schtuff, but were also AFFORDABLE TO AN ELEVEN-YEAR-OLD. They were a source of new ideas to a malleable mind and a stab at authority….Mom didn’t entirely approve of the uncounted hours I spent reading gaming books (maybe it was one too many chainmail bikini’s). My first issue was in like ’82 or 83. We couldn’t afford to subscribe then (we only could buy issues piecemeal for 2 or 3 bucks at the local bookstore). Later, as an adult, I did subscribe (and purchased the first 250 issues electonically). I still have a large stack of both of these magazines somewhere…..OK, OK, I have a large treasure chest full of them and there’s a stray copy of an old one sitting on the coffee table (it really is a treasure chest by the way). For all of the reasons I have mentioned and many others, I am very sad to see them go. Even if they will be back in some form online (I haven’t yet fully investigated all the information on this), I still shed a tear (ok, weep a bit in the shower when no one can see me!). Although I have allowed my subscription to lapse (they weren’t really adding anything new for me anymore….and I really didn’t dig on the whole hyper-tatoo, hip, new D&D feel in which they basked), they were a huge part of my youth….my GeekYouthTM. And because of that, I weep for them. Do you hear me? DRAGON….DUNGEON, I WEEP FOR YOU! I liked how the old Dragon covered lotsa games… plus many of the articles in it were basically sketching out the basis of what would become AD&D 2.0. It was fun to see things develop. Never could get in the the recent “hip tatoo” run, but I’m still sad to see it end. It is sad to see such an icon disappear into the darkness of the publishing void. A true end of an era. Yeah, it really is too bad. I imagine that they may arise again in some form online, but I don’t think it’ll ever be the same really. I seem to recall reading that they’re transitioning to an online publication of some sort, so while it’s not completely “dead” it’s pretty much going to be gone as we know it come September. It is a pity, but the only constant is change I suppose.